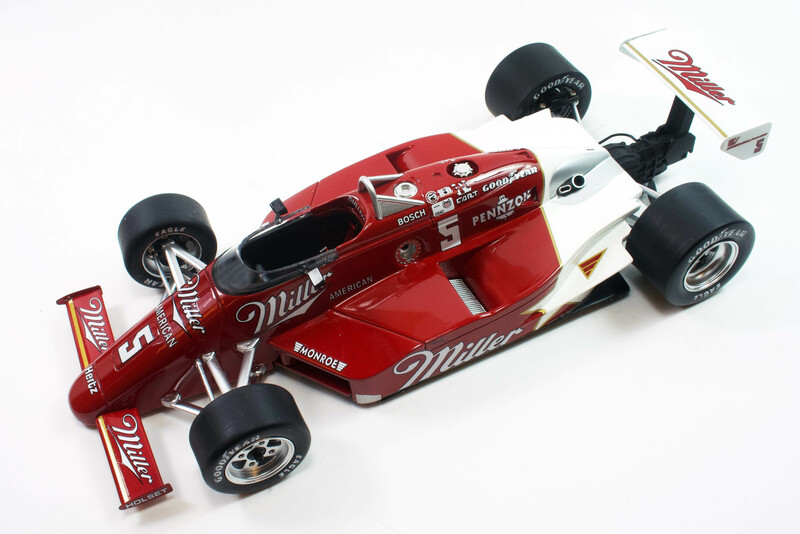 That’s what makes Replicarz’s new 1/18 scale March 85C, the Miller beer-sponsored red and white beauty driven to the Indy 500 win by Danny Sullivan in 1985, such a winner. This is the famous Spin and Win March that almost collected Mario Andretti as Sullivan attempted a pass for the lead on lap 120 at Indy. Andretti had led much of the 1985 race, but Sullivan’s Team Penske March was dialed in after the halfway point. He dove below Mario in Turn One and just after completing the pass did a complete spin without hitting anything. Mario dodged him. Sullivan went to the pits for four new tires and then reeled in Andretti a second time to make a successful pass and win Indy. He led 67 of the 200 laps. That season Sullivan won one other CART-sanctioned race. Ultimately Sullivan would go on to win 17 CART races and the 1988 season championship. He retired after the 1995 season when he suffered a serious accident that broke his pelvis. 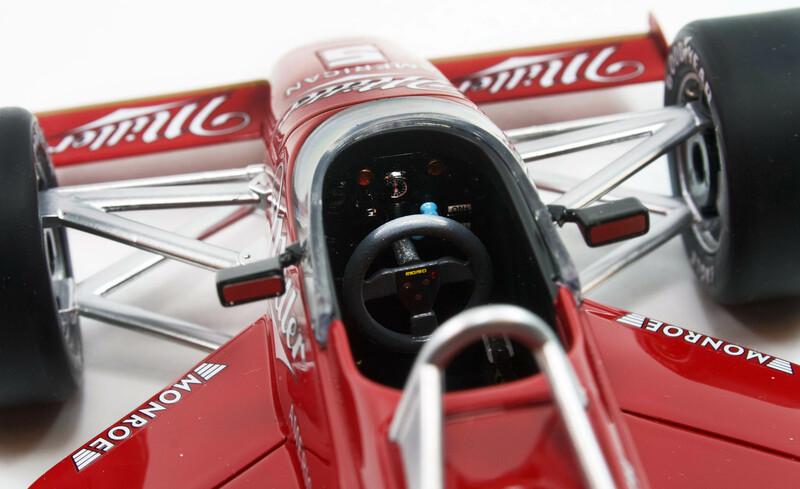 The racy March 85C was designed by now famous race car designer Adrian Newey. Four-time Indy winner Al Unser Sr. drove a similar Penske team car to the CART (Indycar) championship in 1985. Like many, the car was powered by a turbocharged Cosworth DFX V8, the go-to engine in the series at that time and the most successful open-wheel racing engine ever. You won’t see a lot of the engine here as Replicarz has created another beautiful sealed body cast resin replica. A few years back Replicarz also created a sharp 1/43 version of the March 85C in resin. The racer’s high-gloss red and white finish is deep and perfectly reproduced and with minimal sponsorship decals cluttering its surface. White Miller logos are prominent on the racer’s side pods, nose wings, nose and cockpit sides. 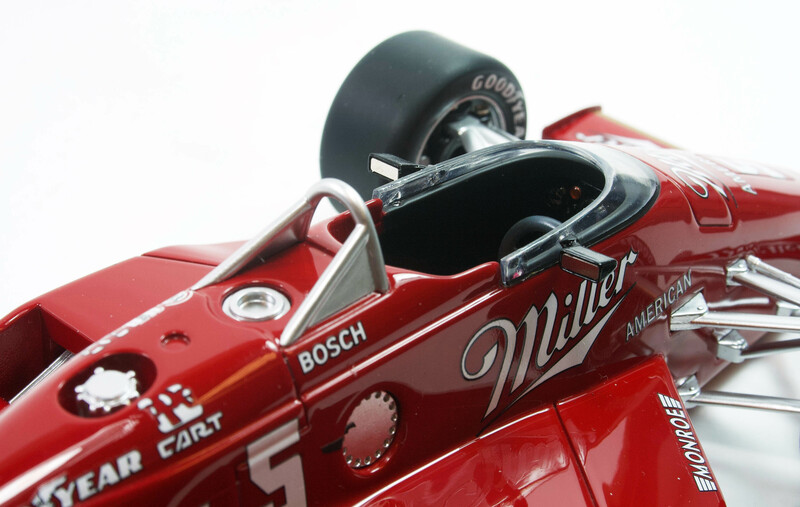 Plus there’s a red Miller logo on the plastic rear wing. This is car No. 5, with a white number on the nose, rear wing’s sides and the engine cowl. Other logos include Monroe, American, Bosch, Goodyear, and CART, the sanctioning body. Tires are properly labeled Goodyear Eagles and satin chrome-look wheels allow you to see through to the drilled brake rotors behind them. 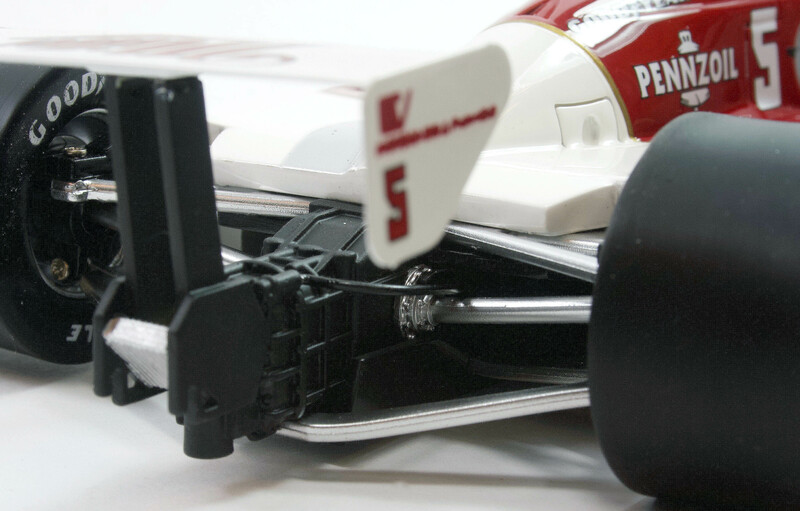 The suspension pieces are a similar matte chrome and plastic, but with solid bracing and linkages to the body. These will not be easily damaged. In back there’s the flat black tail of the engine’s transmission along with minor wiring, plus the flat black rear wing’s struts. On the left side of the engine cowling is a silver exhaust tip poking through the cowl. There also are fuel and other filler openings and you can see silver radiator fins through openings atop both side pods. The cockpit is especially nicely detailed. Sullivan’s name is just behind where the driver’s helmeted head would rest and there’s a nicely formed matte chrome roll bar mounted just behind. Inside is a beautifully detailed dash with gauges, two red lights and two blue knobs with black on white “On” labels next to them. The steering wheel looks to be gray plastic but has some detailing on the three-spoke hub. Replicarz creates an authentic looking red seat harness with buckles and adjustment straps. All told another gem from Replicarz. The only thing that could improve this would be for the bonnet to pop off to reveal that mighty Cosworth DFX.